Over the past couple of decades, RC vehicles of all kinds have become leaner, meaner, and faster. In the 1980’s, a typical basher (such as a Tamiya Frog) would top out at around 25 mph and run for maybe 6 minutes. 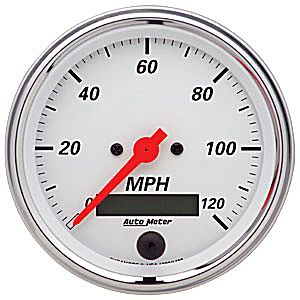 In the 1990’s, average basher speeds were closer to the mid 30 mph range, and in the early 2000’s it was closer to 40. Bashers and racers were generally satisfied, and there didn’t seem to be a need for anything much faster than that. Then, right around the mid 2000’s, the battle for out-of-the-box speed really began to intensify. Traxxas’ excellent 3.3 nitro engine began showing up everywhere, boosting pretty much anything it was installed in to well above 50mph. In particular, Traxxas really showed the industry how it was done by strapping their 3.3 beast into a road-going stadium truck and calling it the Jato. 65mph was easily attained with no upgrades at all, and the bar was officially raised. Other manufacturers responded by shoehorning massive power plants into upgraded versions of their vehicles, and average basher speeds skyrocketed across the board. In no time at all Traxxas responded with the 4-Tec 3.3, a real headcase of a car capable of hitting the 70 mph mark bone stock. Of course there are now many other warp-speed capable offerings from across the RC spectrum, but the real result of all this has been a significantly raised speed benchmark across the RC industry. Technology has been a big factor, what with daily basher race-tuned engines and the rebirth of electric, and of course all these things are great. The problem is that everyone’s expectations have been raised when it comes to performance, and I’m not entirely sure that’s a good thing. Let me explain. The assumption is that more speed equals more fun, but that isn’t completely true. Sure, 40 mph is better than 20 mph, but is 60 better than 40? It’s a lot harder to find a place to run, parts wear out more quickly, and crashes are catastrophic… and more expensive. Let’s now bump the speed up to 80 mph. At this point you need an abandoned airstrip or massive industrial park to run in, and running on anything other than a perfectly flat surface would be suicide. Don’t get me wrong – I enjoy high velocities as much as anyone. My point is simply that speed isn’t the only thing that’s fun about an RC vehicle, and it’s easy to forget that sometimes. My Traxxas Rally VXL, for example, is permanently set to trainer mode. My run times are doubled, my electronics don’t get nearly as hot, and parts breakage is all but nonexistent. I can run it just about anywhere, anytime, and it’s fun as heck. Top speeds are somewhere around 25mph, and that’s just fine by me. It still puts a very big grin on my face, and it takes me back to those first awesome experiences I had with the hobby. Even though today’s off-the-shelf RC offerings are geared for speed, don’t be afraid to dial back the top end a bit. Reduce your throttle endpoints, set your ESC to trainer mode, or detune your nitro engine a bit. You’ll be amazed at how much fun it is to bash even without absurd amounts of power on tap, and your wallet will thank you for it too. When someone asks you “Can I drive it?”, you can say “Sure!” instead of “No, it goes Warp 6 and will kill us all.” Of course, it’s also perfectly acceptable to crank up the power every now and again whenever you’re in the mood for a good old-fashioned speed run. I never said you had to go slow all of the time. my favorite rig is my scaler, which maxes out at a little above a walking pace. more fun than the rest of the rcs that i have right now. This is a problem I have always had when trying to get friends into RC. Whenever I manage to hook one of them, they very quickly become all about the speed. I try to tell them that its only fun the first couple times you drive up and down the street in a straight line at 60mph. After that it gets boring quick. But they don’t listen, and they ALWAYS end up getting out of RC shortly after they get there, if they get there at all. Exactly. It’s often tough to get a newcomer past that “speed is everything” phase and really begin to appreciate the hobby. I usually have to gear down my trucks to make them more driveable . Great article. I hope someone’s listening. As a city driver I find myself telling everyone that wants to drive my Tmaxx , “no”. The truck is so fast that I feel that I have to “Go Somewhere ” and play with it with my kids , but I really just want to stay on my block. When I decided to buy a nitro truck I thought I wanted speed but now that I have this rocket ship on wheels I realize speed is not everything. Thanks Don! Speed really can be a double edged sword. It really gives that wow factor that a lot of people look for, but in most cases drivability just goes out the window. A slow, controllable ride that runs three times as long is (in my opinion anyway) generally a far more enjoyable experience. Tom seems you have been into these of speeddown your trucks… Im wondering is it bad ( for its refrigeration or something else ) for these new high speed rc trucks to go very very slow lets say between. 2-10 mph constantly.